The man created in 1857 with the first proposal of a steam railway through Siberia was an American, Perry McDonough Collins. This banker and gold-dust broker, with fascination for the business potential of steamship travel in Siberia, sailed down the Amur river and then submitted a detailed proposal to the Russian government for his “Amoor Railorad Company”. The American proposal was rejected, as was the first Russian one, presented by Count Muravyev-Amurskii, who was also responsible in 1858 for negotiating the Treaty of Aigun and thereby claiming vast ones in the Amur and Ussuri regions, parts of which are still disputed by the Chinese. Then came the English engineer, named Dull who fielded the idea of building a tramway between Nizhni-Novgorod and Perm, which trams down by horses until finance was available for steam locomotives. This was turned down, as was a variation on the tramway then supplied by another Russian, which envisaged horses galloping down nearly 3 000 kilometers 1 875 miles of wooden funnel. Having giving the order to begin the construction of a continuous railroad line across whole of Siberia, destined to unite the Siberian lands, so rich in natural endowments, with the railway network of the interior, I entrust You to proclaim My will on this matter upon Your return to the Russian land after Your inspection of the foreign countries of the East. Furthermore, I charge You with the duty of laying the foundation stone, in Vladivostok, of the Ussuri section of the Great Siberian Railway, which is to built at State expense and under direction of the Government. Your significant role in the commencement of this truly national task which I have undertaken will give fresh evidence of My sincere desire to facilitate communication between Siberia and the other parts of the Empire and thus will demonstrate to this region, which is so dear to My heart, My very keen interest in its peaceful prosperity. Beseeching the Lord’s blessing upon the long journey through Russia which lies ahead of You. The Tsarevich dutifully arrived in Vladivostok “Mistress of the East” after completing a state visit to Japan (…) On May 31, 1891 he dug the first turf and ceremoniously filled a wheelbarrow as a symbolic start on the Ussuri line. With the promotion of Sergius Witte to Minister of Finance in 1892 the railway received sound financial support and a special Committee of the Trans-Siberian comprising the Heir Apparent and all noted personages of the government was created to oversee the entire project. 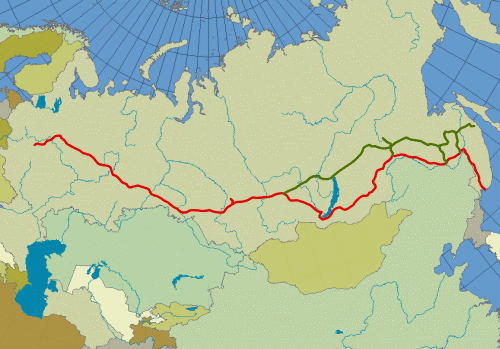 The connection between Perma and Sverdlovsk in 1878 was followed seven years later by a line to Tuymen (...) the line was constructed in two sections, the fiest from Chelyabinsk to Omsk, the second from Omsk to the Ob. In 1897 the first offered train thundered down the line to Vladivostok. The section of railway from Novonikolaevsk, present-day Novosibirsk, to Irkutsk was started in 1893 and built in two stages. The first stage, completed in 1898, run from the River Ob to Krasnoyarsk on the west bank of the River Yenisei. The second, completed in 1899, ran from Krasnoyarsk to the outskirts of Irkutsk. 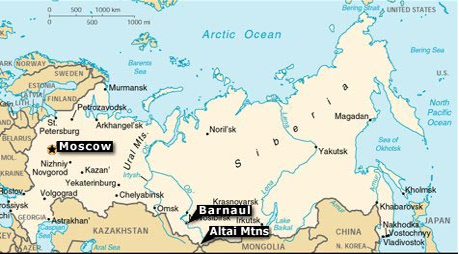 (The Lake Baikal Connection) This line ran from Port Baikal to Mysovsk, along the shoreline of Lake Baikal through some of the most mountainous terrain of the entire railway. 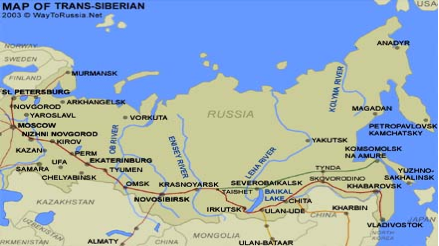 The railway committee decided against running a line beside the River Amur (see the map below) which was prone to flooding and instead negotiated with the Chinese to run a shorter and thus cheaper, line through Manchuria to Vladivostok. The major concern of the Russians, which was not highlighted, was to dominate Manchuria and Korea and gain control of ice-free ports. Since Japan shared similar aims, conflict was inevitable. Construction started in 1887 on two branches to connect the Chinese Eastern Railway with the Ussuri line in the east and the Trans-Baikal line in the west. The eastern section, opened in 1899, ran from Ussuriysk to the Manchurian border at Pogranichny, the western section, opened in 1901, started close to Kaidolovo now Tarkaya approximately 100 km 62 miles south of Chita and continued to Manchuria station now Manzhouli. Construction of the actual Chinese Eastern Railway commenced along two routes. From the Ussuri region teams of laborers worked towards Harbin, whilst from Harbin itself, other teams split up to work westward to Manzhouli and eastward to the Ussuri region. As soon as Dalni now Dalian and Port Arthur now Lushun, on the Liaotung peninsular, had been handed over by the enfeebled Chinese government to the Russians in 1898, work started on the South Manchurian line which ran between these two cities and Harbin, with a spur line to Yingkou. Political upheavals in Peking erupted into the Boxer rebellion in 1900 which eventually led to the destruction of much of the railway facilities and track. Russian troops swarmed in to restore order and, on November 3, 1901, the enire Chinese Eastern Railway opened to provisional traffic running from Manzhouli to Vladivostok via Harbin and from Harbin to Port Arthur. Regular traffic started in 1903. The Japanese considered the railway to be a threat to their interest in Manchuria, and the railway proved to be a spark the set off the Russo-Japanese war between 1904 and 1905. After this war, the Russians surrendered Port Arthur and Dalni and the part of the suth Manchurian line running as far as Changchun. The Soviets continued to dominate northern Manchuria and support the Communist movement in the area of the Chinese Eastern Railway until 1929, when Marshal Chang Tso-Lin, a vehement anti-Communist, was blown up in a train. The Marshal’s son confiscated the railway, but was soon forced by Stalin to back down and accept Soviet “management”. The Japanese invasion of Manchuria in 1931 eventually created such chaos on the railway that the Soviets were forced to chose between another war with Japan or outright sale. In 1933 the Japanese government bought the railway from the Soviet Union for 170 million Yen US$48 million. At the end of World War II, the Soviets again marched into Manchuria, confiscated vast quantities of Japanese equipment and material and set up with Chinese, yet again, spurious “joint” administration of the Chinese Changchun Railway as the Chinese Eastern Railway had been renamed. It was not until 1952, after the Soviet Union had agreed to renounce, without compensation, all rights to Dalni, Port Arthur and the Changchun Railway that the Chinese finally gained outright passion. In 1908 construction of the Amur Railway was started at Kuenga, close to Serensk, and continued out of artillery range of the Manchurian bank of the Amur, in a wide loop via Skovorodino to Khabarovsk. With the opening of the Amur artillery in 1916, the Trans-Siberian Railway had reached its full length. 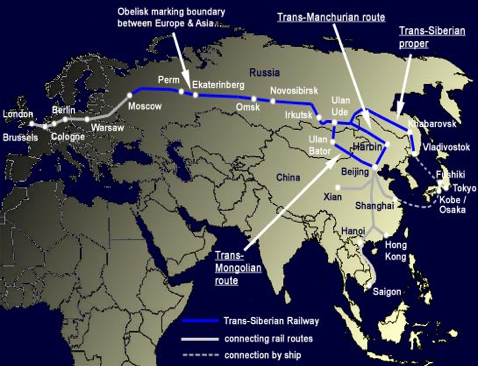 In 1990 China linked its rail system to the Trans-Siberian via Kazakhstan. China calls its uninterrupted rail link between the Chinese port city of Lianyungang and Kazakhstan the New Eurasian Land Bridge or Second Eurasian Continental Bridge. In addition to Kazakhstan, the railways connect with other countries in Central Asia, including Iran, but do not connect all the way to Europe through south Asia.